But the problem isn't with RenderTransform - it's with using the wrong tool for the job! By design, RenderTransform applies its transformations (a rotation in this case) after the layout system has performed its measure/arrange pass. So when the elements in the example are being measured and arranged, the text is still horizontal. It's only after everything has been positioned that the text is finally rotated - and ends up in the "wrong" place. While it's possible to correct for this discrepancy by hard-coding all the relevant offsets in the XAML (very brittle and error-prone) or by adjusting all the offsets in code (only slightly more flexible - and a lot more work), these aren't great alternatives. The right tool for the job is LayoutTransform which applies its transformations before the layout pass. With LayoutTransform, the text in the example is already rotated by the time the elements are measured and arranged, and the desired effect can be achieved quite simply. However, there's no reason to let that stop us. Rotation is rotation whenever it happens, so maybe there's a way to get the already-optimized RenderTransform implementation to do the real work earlier in the layout pass. Unfortunately, we can't change when RenderTransform is applied. Attribution: The XAML example came from a post on designerslove.net; the image is from the set of stock Windows Vista wallpapers. For the most part, using LayoutTransformControl is simply a matter of wrapping the desired content and setting the angle. But it's important to note that some properties will need to be moved from the child control to LayoutTransformControl. For example, when positioning things within a Grid, the Grid.Column and Grid.Row attached properties need to be set on LayoutTransformControl in order to be recognized by the parent Grid. 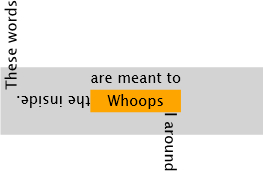 The Stretch on that Path element causes the Button to measure much larger than it should (and a similar issue with the Line element affects the default ListBoxItem style). It's because the Button behaves as it does that sizing with LayoutTransformControl looks like it does. It's comforting to note that applying the Silverlight Button style to a WPF Button and using the real LayoutTransform gives the same wrong-looking behavior. Thing 2: The rotated rectangle used by LayoutTransformControl for its child content is slightly different than that used by LayoutTransform under certain circumstances. This causes the child control to layout in a slightly longer, narrower rectangle and can be seen in the first column of the WPF test matrix. Perhaps surprisingly, this difference is deliberate. When determining the parameters of the rotated rectangle, the WPF algorithm finds the largest rectangle possible (as measured by area). It just so happens that the algorithm I came up with manages to find an even larger rectangle in certain cases. :) As far as I've seen, the algorithm in LayoutTransformControl is never worse - and sometimes better - so I decided it's a winner. I've omitted any technical discussion of how LayoutTransformControl works from this blog post. For now, curious readers can refer to the commented source code. If there's interest, I'll write a follow-up post explaining what's really going on under the covers. LayoutTransformControl was an interesting project that demonstrates once again the power and versatility of the WPF/Silverlight layout system. 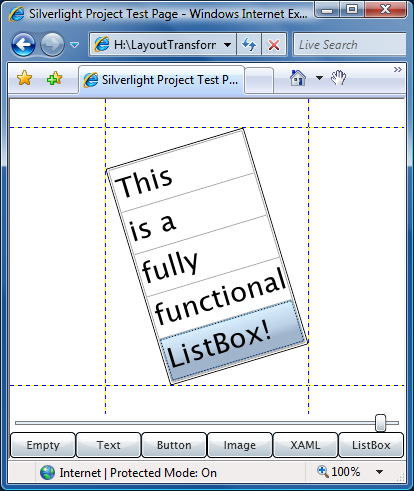 LayoutTransform and RenderTransform are like peanut butter and jelly - and I'm glad to help reunite them on Silverlight. If you've got a layout problem and RenderTransform isn't doing what you need, maybe LayoutTransformControl is the solution! If you've made much use of data binding in WPF or Silverlight, you've probably come across the IValueConverter interface. IValueConverter sits between the data source and destination and gives the developer a chance to examine/alter/replace the data as it flows through the converter. It's been my experience that IValueConverter is a powerful and versatile tool for application developers. As part of a recent project, I wanted to display some of an object's properties in a simple list. Specifically, I had an instance and I wanted to display a list of "Property Name: Property Value" entries for each property of that object. My background with ListBox led me to naturally think of using ItemsControl for the basis of my property viewer; the ItemsControl content model (with its support for DataTemplates) seemed like a natural fit. Aside: One of the key things XAML enables is a distinct separation of implementation from representation. By explicitly separating most aspects of how an application looks (XAML) from how it works (code) as part of the developer/designer workflow, WPF and Silverlight help to enforce a level of encapsulation (in the object-oriented programming sense) that makes programs easier to write and maintain. In the ideal world, a program's functionality is entirely expressed in its code - and so it's possible for others to completely change that application's appearance without knowing or caring how it's implemented. Just like the web has CSS restyling contests, WPF has reskinning competitions! So I knew I wanted to use ItemsControl and I knew I wanted to keep the UI aspects of the property viewer in XAML-space (what it looked like, what properties it displayed, etc.). I started looking at how IValueConverter might help and that led to the solution I describe here. PropertyViewer ends up being quite simple to use - and a good demonstration of the power of IValueConverter! /// public properties as a collection of bindable name/value instances. ///   that exposes a property's Name and Value as properties. ///   which order) by passing a space-delimited list of names. ///   will be used instead of the property name. ///   of Bindings, and more. Because the end result is a collection of objects, all the existing ItemsControl knowledge and techniques can be used to completely customize the look and feel of the property viewer! The examples above came from a simple application I wrote to demonstrate PropertyViewer in action. By design, the exact same XAML and code work on both WPF and Silverlight. To prove it, I attached the complete source code for the combined Visual Studio 2008 solution to this blog (download it from the link at the bottom of this post). 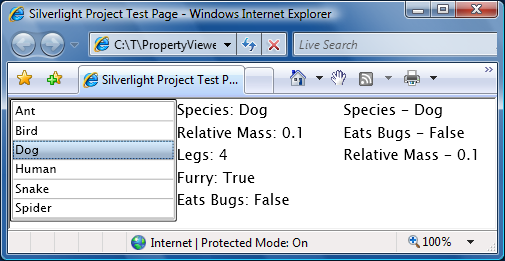 The sample displays a list of animals, one default PropertyViewer, and one customized PropertyViewer. Select any animal to find out more about it (note that the PropertyViewer updates automatically when the data source changes). Thanks to the power of IValueConverter, it's easy to use PropertyViewer to display an object's properties in a customizable way. Additionally, PropertyViewer can help troubleshoot data bindings: just drop one in the target location and you can see the available properties along with their current values. I originally wrote this for my project - but now I hope you can use it in yours!